Nowadays, to make a better life, people are trying various kinds of ways to get more convenience and entertainment. Since cars are easily accessible to more and more people, the in-car entertainment and the driving experience arouse car owners’ s attention so as to make more enjoyment during the driving. If you know how to install a 2005-2012 Mercedes Benz ML Class W164 car stereo, it’s a good idea that you upgrade your factory radio for more practical and amusing features. Then are you going to ask a professional technician to help you install the new car stereo? In fact, the installation is not so complicated that you can do it by yourself with a correct guide. But if you have no experience or any guide for the installation, it’s wise of you to finish it under the guidance of a professional. 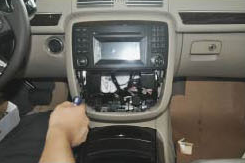 The following is the general idea about how to remove and install a new 2005-2012 Mercedes Benz ML Class W164 car stereo for you as a reference. 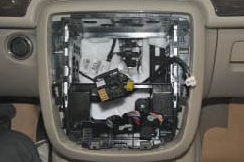 Pry out the air conditioner panel along gap with a lever. Remove the air conditioner panel. 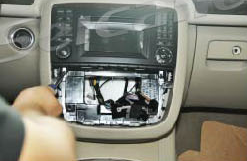 Remove two screws holding the stereo in the dashboard frame with a screwdriver. Carefully take the original CD player out of the dashboard. Disconnect the ISO plug of the car in the socket of the DVD player. 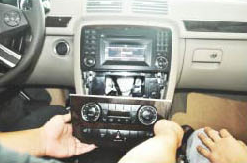 Connect the cables of the new Seicane car stereo as the user manual shows. Put the buckles back into its original place. Install two screws and the air conditioner panel. Turn on the new Seicane radio and have a comprehensive test if everything works well. Hopefully the above instruction can be helpful for you. If you have any questions for the removal and the installation, you can turn to a professional or your dealer for help. Here I’d like to share an ideal car stereo for 2005-2012 Mercedes Benz ML Class W164 particularly from Seicane for you in order let you make sure you have the right stereo to install. 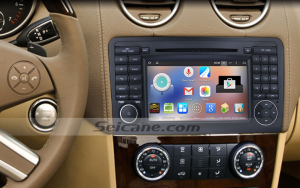 Running on an advanced Android 4.4.4 operation system, this 2005-2012 Mercedes Benz ML Class W164 car stereo is equipped with worldwide real-time navigation function of high accuracy. With current location, speed, mileage, landmark building display, 3D street view, destination search and turn-by-turn voice directions, it can guide you to anywhere you like within the least time. The dual zone function lets you enjoy your favorite music while you are navigating to your destination. The built in BC6 Bluetooth module is specially developed for hands-free calls and music streaming. To keep safer on the way, you can dial and receive calls without taking your hands off the steering wheel. The capability to stream your favorite tunes from the Smartphone wirelessly is also desirable. For more flexible features, you can choose the digital TV, car DVR, Mirror link, Backup Camera, OBDII, etc as options to get more convenience according to your own needs. Last but not least, it can support a fiber optic decoder. If you have a Mercedes Benz ML Class W164 from 2005 to 2011 which comes with optic fiber Bose, then you can install a decoder to support your original car’s optic fiber Bose system. With easy installation, the sound is of high quality. And the decoder is just plug and play. On the other hand, if your car comes without optic fiber Bose system, then this unit is very easy to install and is plug and play. 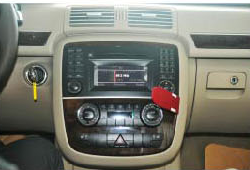 Upgrade your car with this amazing Mercedes Benz ML Class W164 car stereo, it’s the time now! 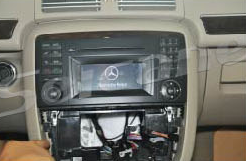 This entry was posted in mercedes-benz car stereo and tagged Mercedes Benz ML Class W164 car stereo. Bookmark the permalink.